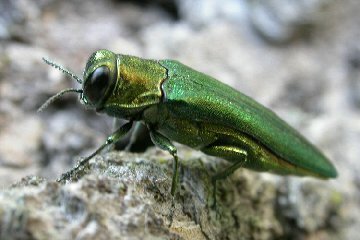 1) Emerald ash borer: The emerald ash borer is a destructive wood-boring pest of ash trees. Native to China, Mongolia, North Korea, South Korea, Japan, Taiwan, and the Russian Far East, the emerald ash borer beetle (EAB) was unknown in North America until its discovery in southeast Michigan in 2002. Today, EAB infestations have been detected in 25 states; Arkansas, Colorado, Connecticut, Georgia, Illinois, Indiana, Iowa, Kansas, Kentucky, Louisiana, Maryland, Massachusetts, Michigan, Minnesota, Missouri, New Hampshire, New Jersey, New York, North Carolina, Ohio, Pennsylvania, Tennessee, Virginia, West Virginia, and Wisconsin. More than one million ash trees in the U.S. and Canada have been harmed by EAB. 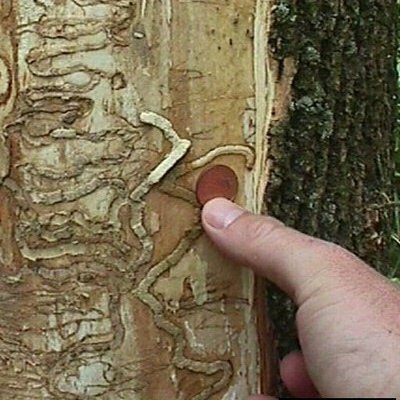 In just 10 minutes, you could visually detect the signs of an EAB infestation. 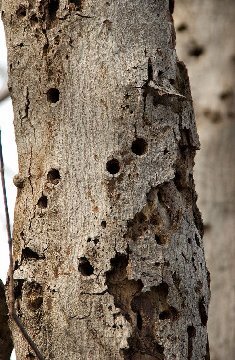 An infestation can be recognized on ash trees by D-shaped holes or shallow S-shaped trails under the bark. 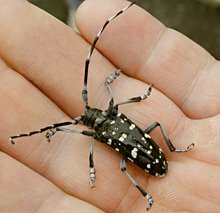 Visit the links below for more information on this insect and control of them. Visit the link below for more information on plant insects and diseases.